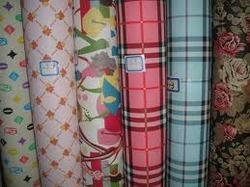 We are one of the acclaimed manufacturer and supplier of a wide range of printed leather. Our products are processed by our associated vendors using best available technologies that help us ensure their better quality and optimum usability. Suntop® is one of the leading manufacturers of Technical Textiles such as Synthetic Leather, PVC Films & Sheeting, PVC Coated Fabric, Cotton Canvas and Vinyl Flooring and is growing continually at a brisk pace. These products have their applications in various finished products such as Upholstery, Shoes, Garments, Bags, Purses, Medical accessories, Shower curtains, File folders, Table Mats, Diary covers, Fridge covers, Rain coats and various types of floorings. Suntop® came into existence under the lights of Mr. V.K Chawla having an experience of nearly two decades in the artificial leather cloth industry, as an endeavor to fulfill the ever-growing needs of the Technical Textiles such as Synthetic Leather, PVC Films & Sheeting, PVC Coated Fabric, Cotton Canvas and Vinyl Flooring market. Today, its most popular brand Suntop is a name to reckon with in the market. It was the vision of the founder of the company to provide products which serves the need of the market and at the same time exceeding the expectations of the customer because of its Client Oriented Approach.